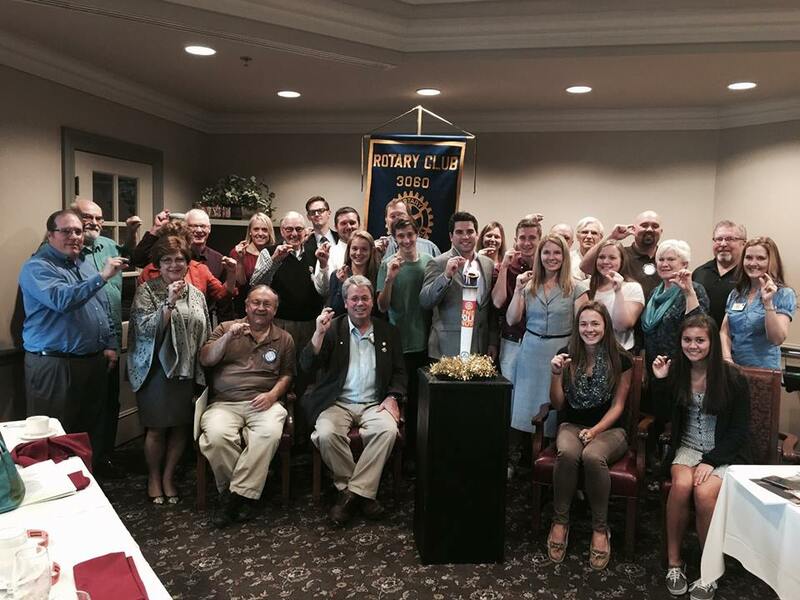 Welcome to The Rotary Club of Saline Michigan! 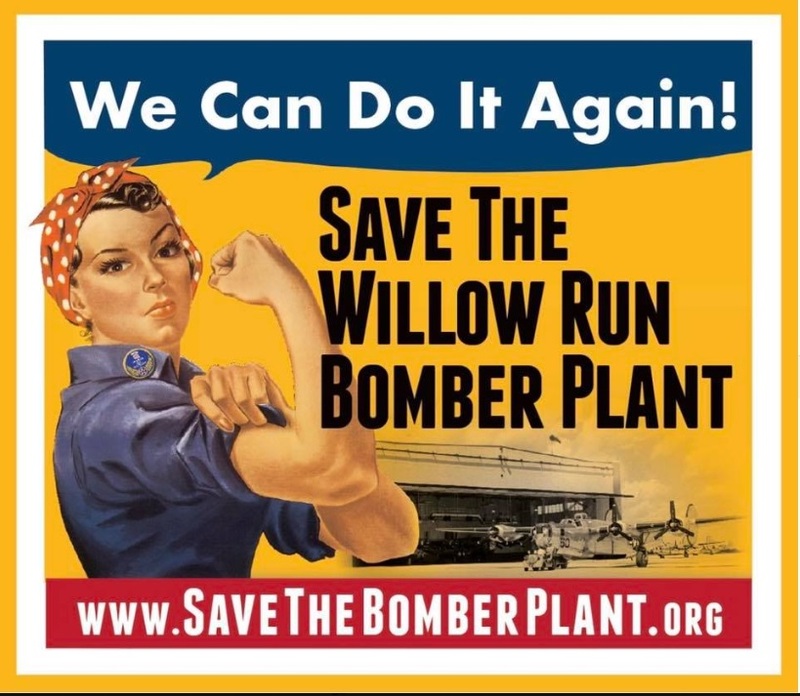 Alison Beatty spoke at the Rotary Club of Saline and gave a great history of the Willow Run Bomber Plant and Rosie the Riveter. 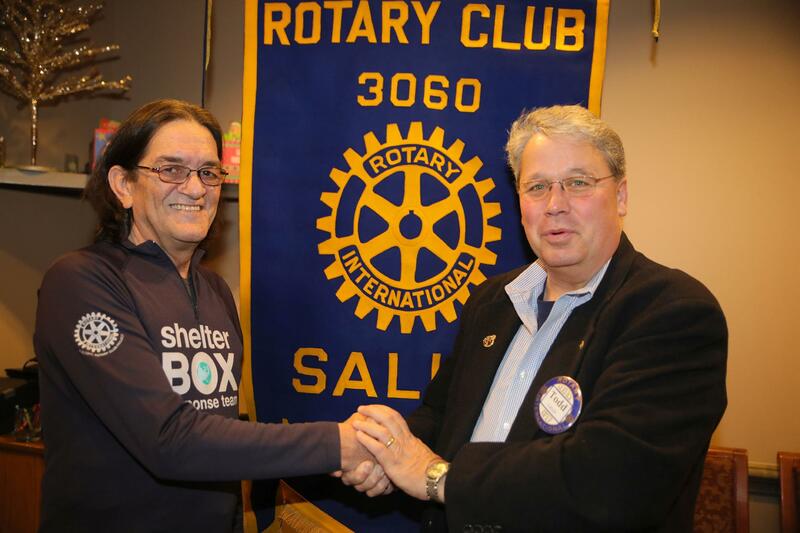 ShelterBox volunteer Derek Locke is pictured with Todd Lands, President of Saline Rotary. Derek Locke, a member of the Rotary Club of Dearborn Heights, spoke to Saline Rotary Club members Thursday about ShelterBox, a humanitarian organization that helps displaced people around the world. According to Locke, originally from Plymouth, England, at any given moment, there are 85 million around the world who are displaced by natural disaster or conflict. ShelterBox and its volunteers provide shelter, tools and support to people working to recover. The organization provides "ShelterBoxes" and "ShelterKits." The boxes contain family-sized tents specially designed to withstand the elements. The kits contain tools that people need to start rebuilding their lives. The include ropes, fasteners, heavy-duty tarps, shovels, saws, hammers and other tools. ShelterBox also provides solar lights, mosquito nets, water purification equipment and other important gear. ShelterBox needs volunteers and monetary donations. 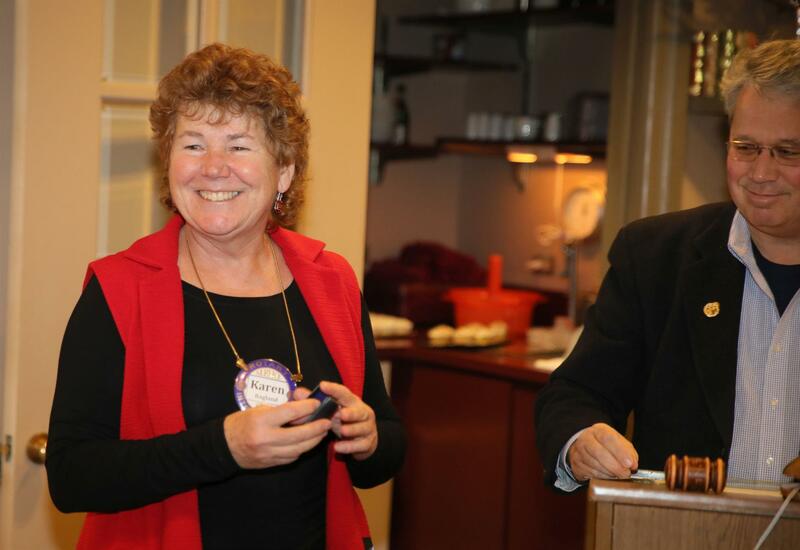 Saline Rotary Club member Karen Ragland was all smiles after receiving the Paul Harris fellow pin..
At Thursday's Rotary luncheon at Travis Pointe Country Club, Ragland received the Paul Harris Fellow recognition. It is awarded to those people who donate $1,000 to The Rotary Foundation of Rotary International. It was Ragland's second time receiving the honor. Ragland, a tireless community volunteer who is currently performing interim duties for Saline Main Street, is owner of Design Hub. Many notable people are Paul Harris fellows, including U.S. President Jimmy Carter, Russian President Boris Yeltsin, U.S. astronaut James Lovell, UN Secretary-General Javier Perez de Cuellar, and Jonas Salk amoung other. Over the last 100 years Rotary Foundation has spent $3 billion on life-changing, sustainable projects. One of the foundation's main goals is the eradication of polio. For every dollar Rotary commits to the eradication of polio, the Bill and Melinda Gates Foundation commits $2. 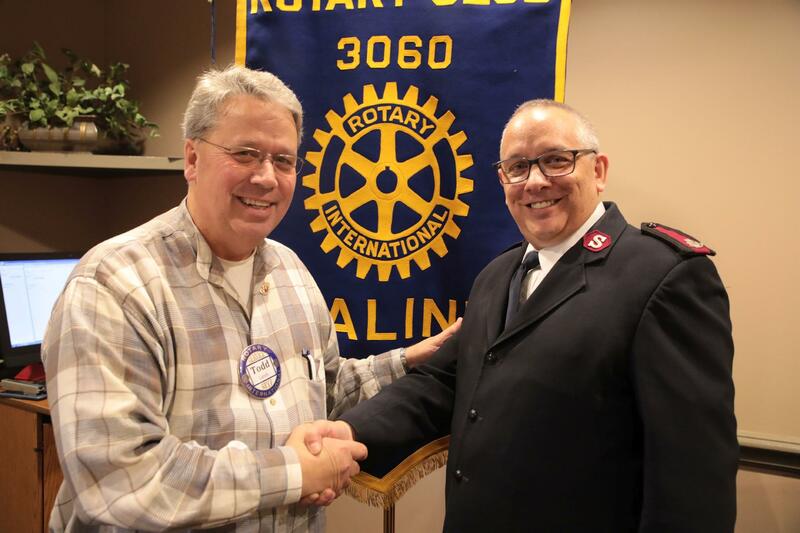 The Saline Rotary Club listened to Chris Wood, Washtenaw County coordinator for The Salvation Army, at Thursday’s meeting at Travis Pointe Country Club. The Salvation Army was founded in 1865 in London by Methodist preacher William Booth and his wife, Catherine. Wood’s ancestor’s, who were jewelers in London, were curious when they watched the group parading down the street in military-style uniforms, playing music and making noise and eventually, they joined the group. “They believed people could change and become respectable citizens once again. 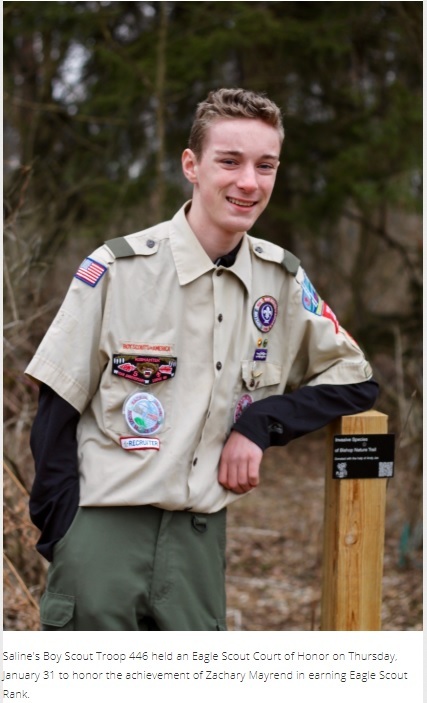 And that they could change the world if you made enough noise and wore the uniforms,” Wood said. Today, that spirit still exists. “We feel like we can save the world. We believe addiction can be rehabilitated. We believe someone who made poor choices can turn their life around and start making good, healthy choices,” Wood said. Salvation Army volunteers in communities across America, dressed in red aprons and often ringing bells, stand in the cold each Christmas season to ask people to donate to their mission. For this task the Salvation Army also employs some part-time employees – many of whom are uses of their services. In Washtenaw County The Salvation Army operates two shelters and community centers. It provides housing access services which can help keep people from being evicted or get them to a shelter. The thrift stores also support alcohol and drug rehab centers in Monroe, Detroit and Pontiac. About 80 percent of The Salvation Army’s donations come at Christmas, and the kettles program is still the organization’s top fundraiser. You’ll find Saline Rotarians at the red kettles in front of Benny’s Bakery on Saturday mornings between Nov. 25 and Dec. 23. 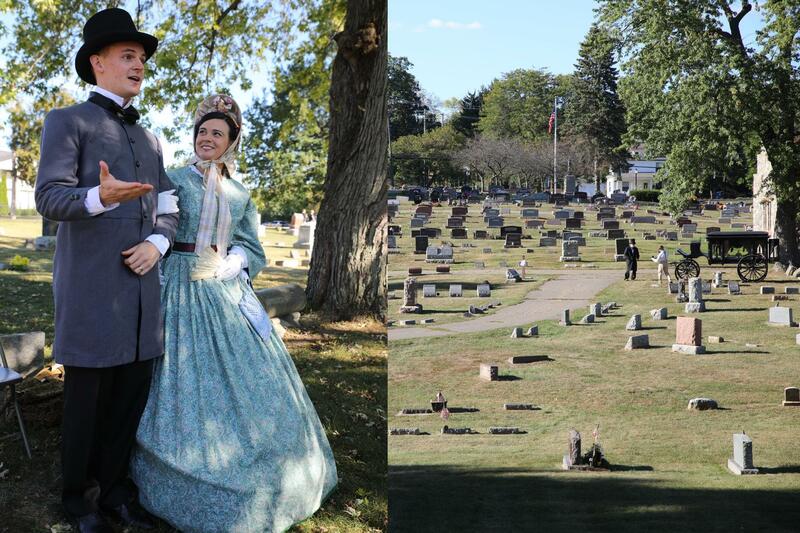 Salinians joined Saline Rotary Club volunteers and actors as they stepped back in time at Oakwood Cemetery Saturday. The annual Oakwood Cemetery Enactment Tour, which raised money for Saline Rotary Club’s benevolent activities, re-animated some of Saline’s most interesting historical figures. Each of the actors presented biographical vignettes. The event was attended by local history buffs, members of local government, and citizens who enjoyed interesting stories as they strolled around the cemetery on a sunny autumn day. The link below will take you to a story published by the Saline Post which has video clips of the event. Click here: for the story on "Storify"
The Rotary Club of Saline bid on and won a beauty, Reserve Grand Champion. His name is Stanley, he weighed in at 1,411 lbs. Have you ever wondered about who built the big house on Michigan Avenue with the large fenced yard known today as the Davenport-Curtiss Mansion? Do you know who founded Saline and how it happened? Come and hear the stories of the people who settled in Saline and what their lives were like back then.Rotary Club of Saline invites you to discover the answers to these questions and many others. Get to know the people in the 1800’s that formed the basis of Saline today! There will be 13 enactments this year. City Council Member, Linda TerHaar, commented that the tour last year was informative and fun. Jim Roth, Saline author and historian, thought it was well organized, interesting and the actors in their period clothing did a great job! If you came last year and enjoyed it, come again to hear new stories of the people that once lived here. TIME: Saturday, September 30, 2017 2pm-6pm. Sign up for your group time when you purchase your tickets. Rain date is Sunday, October 1st from 2pm-6pm. PLACE: Oakwood Cemetery at Michigan Ave. and Monroe Street. Walk to the Mausoleum to check in and get with your group. There will be an introduction for each group. TICKETS: Buy on line at salinerotary.org/Site Page/purchase-cemetery-tour-tickets Cost is Adults- $12 or $18 the day of. Children 12 and under are free. Recommended for school age children and above. BE SURE TO SIGN UP FOR YOUR START TIME! TOUR LENGTH: Plan on about an hour. Wear comfortable walking shoes. PARKING: Free parking at Annie’s Day Care across from Oakwood Cemetery on Monroe Street or street parking is also available. Todd Campbell, President of the Rotary Club of Saline, presented a check for $1,000 to Carol Owen of the Saline Boy Scout Troop 446 today, Thursday, March 5, at the weekly meeting of the Rotary Club of Saline. 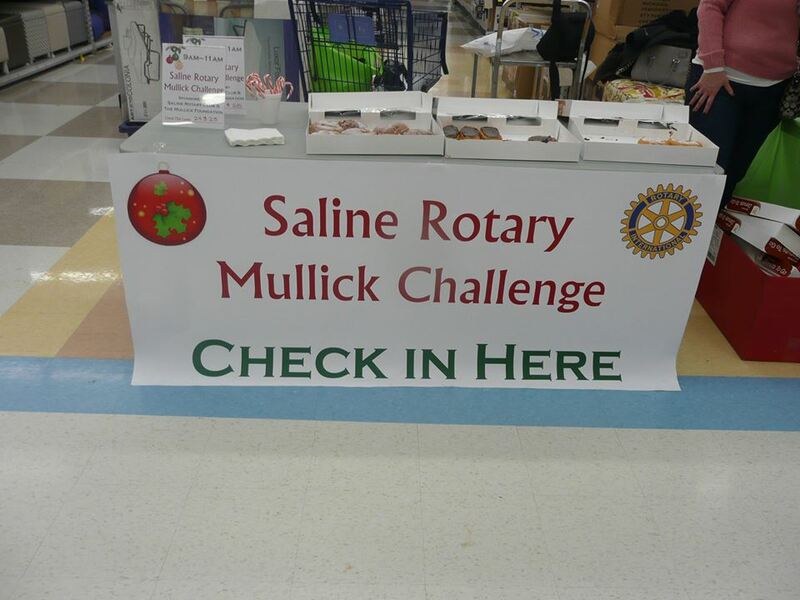 Saline Rotary's Mullick Challenge (formerly the Fagin Challenge) shopping event was on Saturday December 6. We were able to provide Christmas gifts to 120 kids! Thanks to our partners, the Mullick Foundation and Meijer (Ann Arbor Saline Rd). Smita Nagpal added her high tech talents to the mix at the the Saturday night celebration of Michigan's ethnic diversity during the Second Annual Michigan International Festival co-sponsored by The Rotary Clubs of Ann Arbor West, Saline and Ann Arbor North. 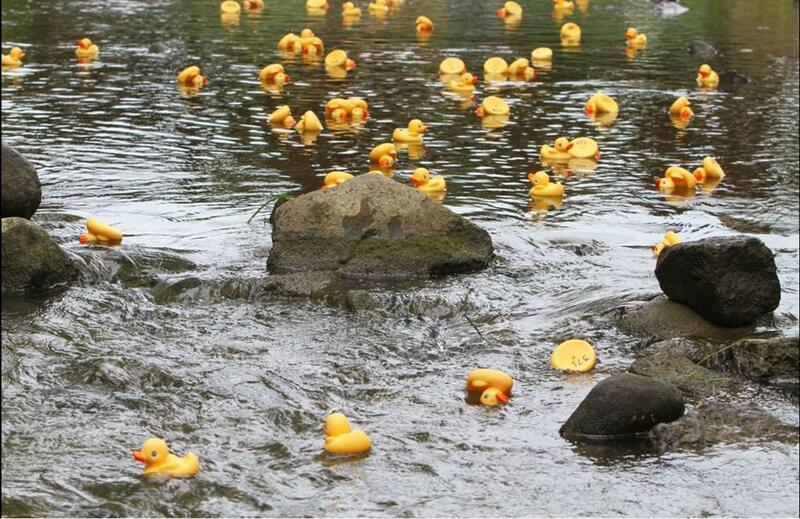 A Toledo-area woman, Gisela Cane, who made her first visit ever to thee Saline Celtic Festival won $300 in the Saline Rotary Club duck race at Mill Pond Park. Her duck number 483 was the fastest in the final run of the duck race. Second place went to duck number 423 winning $200. Third place went to duck number 222 wining $100. 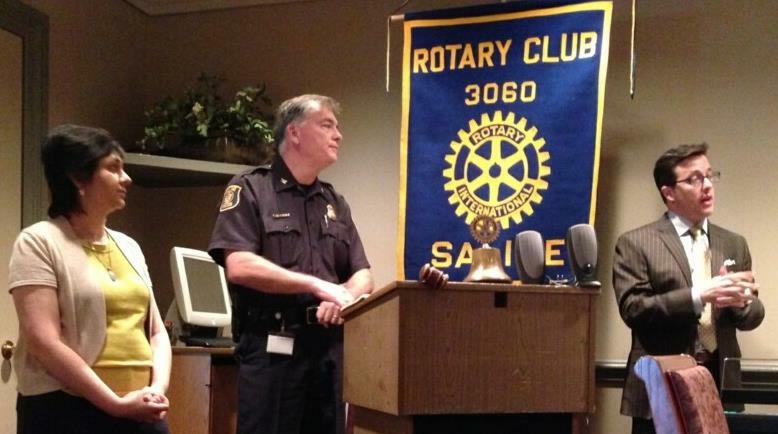 Mayor Brian Marl, Police Chief Larry Hrinik and Rotarian Smita Nagpal spoke to The Rotary Club of Saline about the Saline Community Substance Abuse Prevention Task Force. 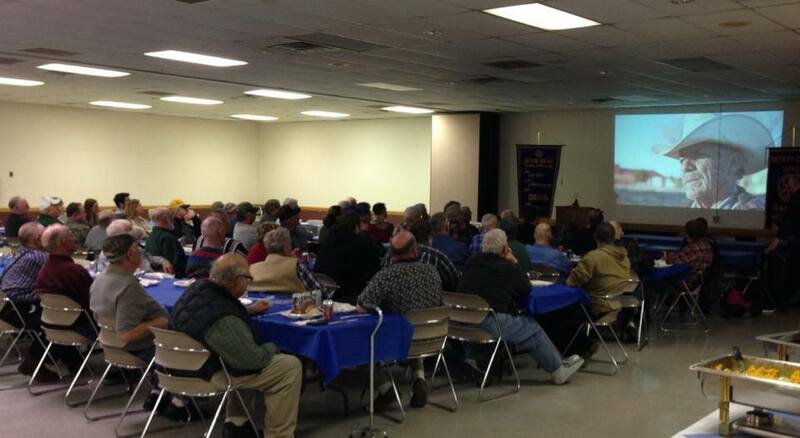 Great crowd at Saline Rotary Farmer Day! David Mellor from Saline High School Future Farmers of America was the speaker. 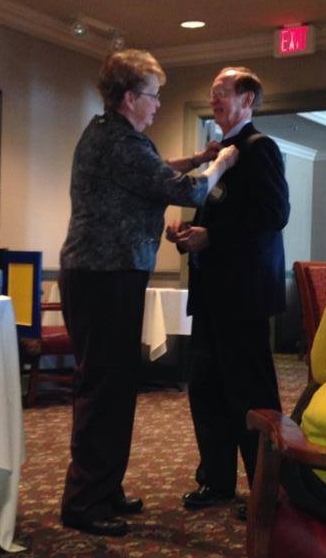 Rotarian David Blough receives his Paul Harris Fellow Sustaining Member pin from Past District Governor Gail Scott. He qualified for the honor through donations to The Rotary Foundation. 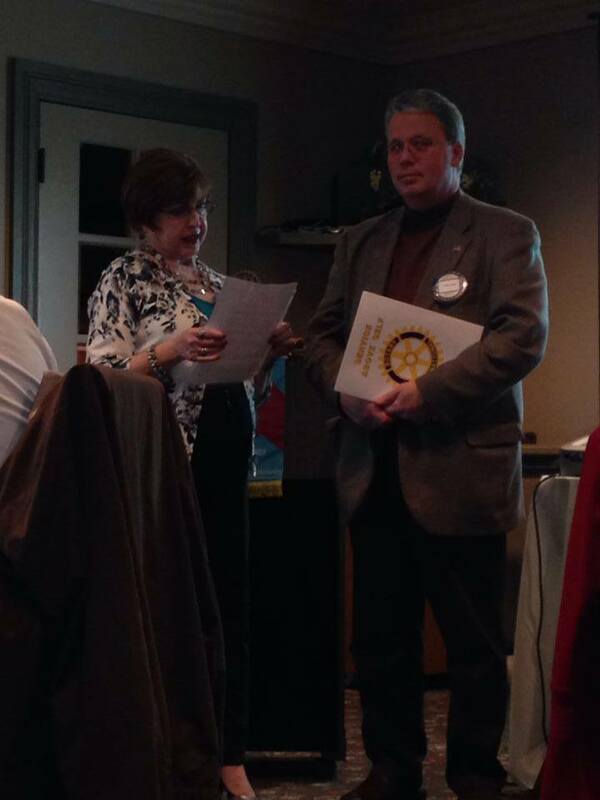 Ginger Winter presided over the induction of Todd Lands into the Rotary Club of Saline. Welcome Todd. Past President Bob Comfort was presented his Paul Harris Fellowship Certificate and Pin by Jill Durnen, Club Administrator, at our Thursday meeting. A Paul Harris Fellowship is awarded to those Rotarians who have contributed one thousand dollars or more to the Rotary Foundation. 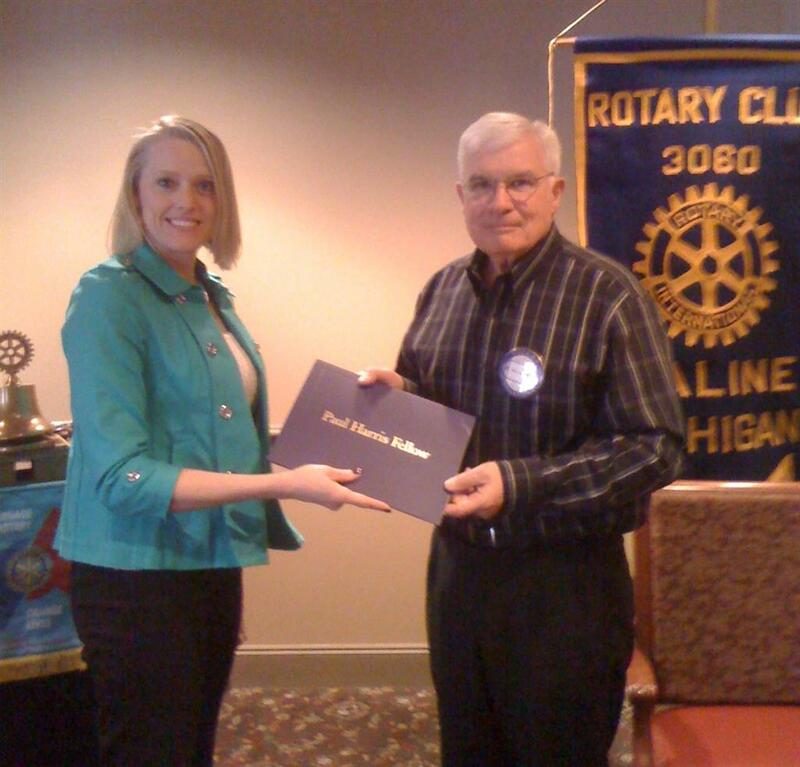 Bob joins several other members of the Rotary Club of Saline that have received Paul Harris Fellowship Awards. Congratulations to Bob. 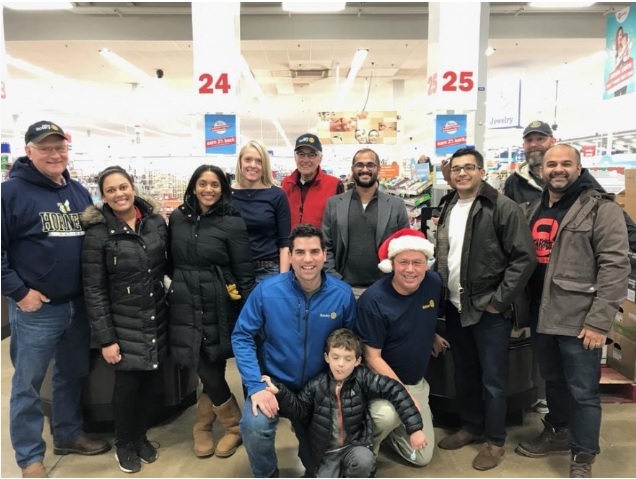 The Rotary Club of Saline sponsored its' annual shopping spree for kids at Meijers in Ann Arbor. 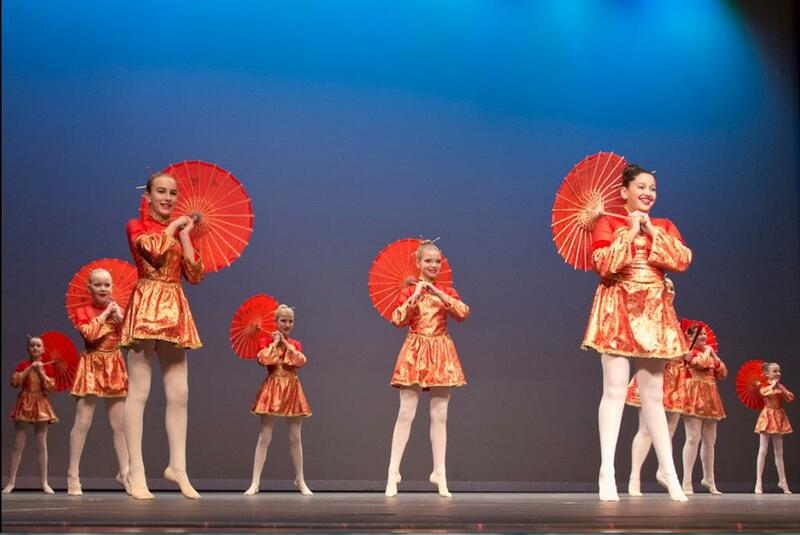 Rotary Club of Saline joined other Rotary Clubs in hosting the International Festival at Saline High School Saturday.